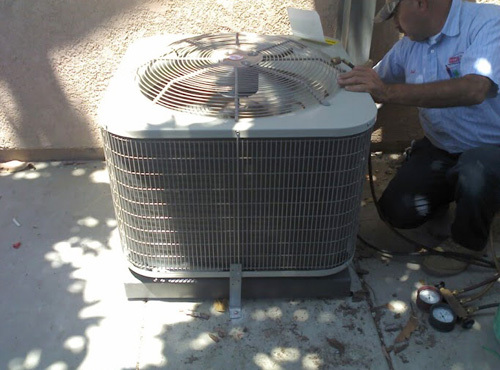 As Long Beach's oldest and largest heating and air conditioning contractor, Long Beach Heating and Air Conditioning is the preferred choice among tens of thousands of local home and business owners when they need air conditioning service and repair. All of our service technicians are EPA and NATE certified, highly experienced, and Bryant® factory authorized. We service and repair all major brands, and also perform repairs under warranty. By following today's best practices for AC service and repair and providing superior customer service, we've earned high ratings on both Angie's List and Yelp and have been awarded Bryant's prestigious “Circle of Champions” award two years in a row. Our technicians arrive in uniform, fully prepared to start working. To resolve most issues on the first call, they keep their trucks well stocked with commonly needed parts, such as motors, contactors, fuses, electrical breakers and condensate pumps, and the latest equipment for troubleshooting, diagnostics, and repairs, including state-of-the-art refrigerant gauges, portable welding machines, vacuum pumps, refrigerant recovery machines, and more . We also stock refrigerant on our trucks. As soon as the technician arrives on site, he will immediately try to determine what's causing your air conditioner to malfunction and then provide you with your best options for fixing it. We charge $89 for diagnostic visits and provide upfront, flat-rate price for repairs. The cost of the repairs primarily depends on whether you prefer OEM or universal parts. Universal parts can provide substantial savings to our clients, but OEM parts can ensure that your warranty stays intact. After we have a signed work order, we'll work neatly and efficiently until the job is done. We respect your property, so we use drop cloths around our work areas and wear booties if we need to walk inside your home or business. Air conditioner repairs are done in accordance with the industry's best practices and backed by a 30-day warranty on parts and one-year warranty on labor. Call today to schedule air conditioner service and repairs anywhere in Long Beach, Signal Hill, Huntington Beach, Los Alamitos, Palos Verdes, Downey, or any other nearby city. We're fully licensed and insured, as well as locally and family owned. We're available Monday through Friday, from 8am until 5pm, and provide priority scheduling to those on a Residential or Commercial Service Agreement. Our service technicians don't work on commission, so you don't have to worry about any high-pressure sales tactics or upselling. Rather, our technicians stay focused on diagnosing and fixing each client's AC problems in the most cost-effective manner possible. We provide upfront, flat-rate pricing on air conditioner repairs. Only when our service technician feels that it is in your best interest to replace your system rather than repair it will he present that option to you. If you do decide to replace your air conditioning system, then we will waive the diagnostic fee. Click here to learn more about our air conditioner sales, installation, and replacement services.